Three sporting alumni from The University of Nottingham have been selected to compete for Team GB at the Rio Olympics next month. Nick Catlin, who graduated in History, Harry Martin, an Economics alumnus, and George Pinner, who graduated in Management Studies, have been successful in team selection. 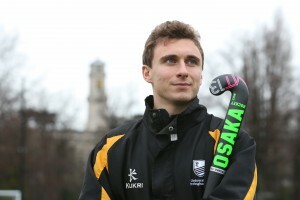 They will be joined by former University of Nottingham hockey coach David Ames who led the team to success at British Universities and College Sport (BUCS) last year. The news comes as The University launches its Olympics website– designed to show support for former and current students who are competing or have an involvement in Rio 2016. The pages will contain latest news, blogs, videos and competitor profiles as well as academic expertise for all things sporting. Nick and Harry were part of the squad who finished fourth at London 2012 Olympics. It was double celebrations for The University’s sporting stars as it was also announced that National Badminton League player and captain of the University of Nottingham Badminton team, Chris Adcock had also been selected for Rio 2016. During the 2012 games Nottingham was the second most successful University in the medal table. Find out more about our sporting alumni who have high hopes for Rio here and follow @UoNSport for all the latest selection news. What happens when sporting rules go awry? Medal success on the water!